Why did human surgeons stop using Lasers? For the same reasons Advanced Care never used them . . .
Vets purchasing a $40,000+ laser scalpel MUST promote "less pain" and "less bleeding" to encourage unknowing consumers to pay upcharges to pay for the questionable device. Don't pay an upcharge because it's laser surgery. Dr. Gerds reads respected veterinary journals like the Journal of the American Veterinary Medical Association for medical evidence documenting claimed benefits of laser. Verifiable results for direct comparison of a laser scalpel vs. a steel scalpel are inconclusive at very best. Most studies find blood loss reduction is statistically and medically insignificant. Pain reduction is currently impossible to measure or verify. Perhaps measurement will be possible soon. Fact: the pain meds your pet goes home with are the same for laser or traditional procedures. Searching the internet long enough, one can find results supporting the superiority of either method. 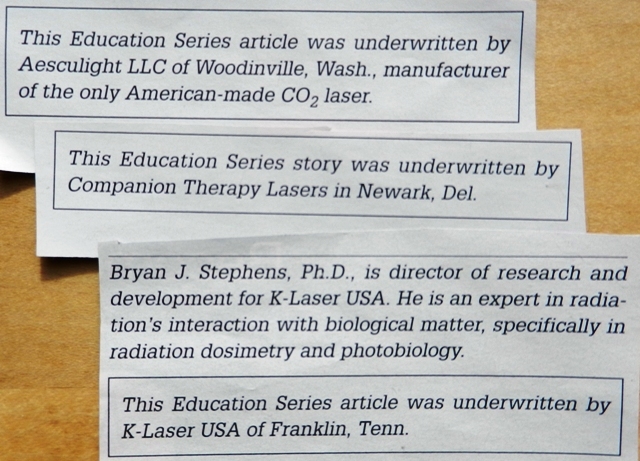 Be aware, references of articles appearing on laser company websites and in lesser veterinary trade magazines often are "underwritten" (paid for) by laser companies themselves. Advertising in veterinary magazines for laser tools promise vet clinics huge sales and an "Advanced" image. Frankly it is another way to creatively extract money from your wallet. Question: Does a laser scalpel benefit the vet, the patient, both, or neither? Education "articles" are often paid advertising in disguise. If no conclusive medical benefit exists, is the method "advanced?" The ACVS is the professional organization of Board Certified Veterinary Surgeons. They are at the top of the proverbial ladder when it comes to the veterinary surgery standards and guidelines. "The laser is claimed to be less traumatic and cause less hemorrhage, swelling and pain, however, this has not been proven, however laser declawing is an acceptable method." Therefore a laser "is an acceptable method," claims of less bleeding, swelling and pain "has not been proven." In the 1980's and early 1990's. Lasers were on the "cutting edge" of human soft tissue surgery. Today, in human medicine, lasers only enjoy widespread acceptance in cosmetic or "aesthetic" surgery for tattoo removal, wrinkle removal, varicose veins. Lasers are IDEAL for LASIK procedures. Keep this in mind if you want these procedures for your pet. A touch of humor in case you're still reading. For soft tissue cutting, like those performed by veterinarians (spays and neuters), human surgeons today use conventional steel scalpels. Why does a vet use laser? When the market for lasers collapsed in human surgery, manufacturers turned to veterinarians for sales. Laser Surgery Benefit Claims: Fact or Opinion? Less pain and bleeding using laser scalpels claims are not supported in fact by respected, leading human or veterinary journals of medicine. No solid, hypothesis-driven blind comparison research of lasers with traditional methods exist in veterinary medicine. Pet owners would like to believe, that after a short painless procedure the pet goes home with no worries. That is not fact. Post surgical care and pain medication protocol are identical regardless of surgical method. The laser companies are quick to promote their electric scalpels and procedures, even before safety is well documented and laser doctors are fully experienced. 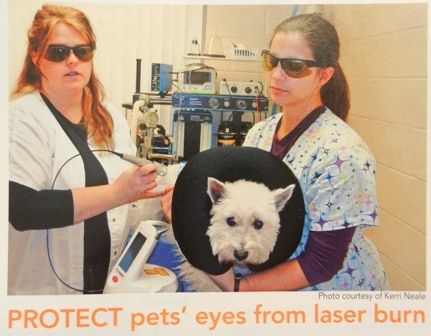 Aggressive marketing of lasers has contributed to their popularity among some veterinarians. Significant controversy and confusion surrounds laser use. Operator experience is critical (as is with traditional surgery). Commercial laser companies present laser equipment as being simple to operate. A laser scalpel has a learning curve before it can be utilized perfectly. Complications such as the burning of tissue and delayed healing are more likely with a less experienced user. The CO2 laser beam itself is invisible. The pet must be draped in a special fashion: the face is surrounded by wet cloths and shielded to prevent fires (if the laser strikes dry cotton) or burns (if the beam strikes inadvertent areas of skin). Special instruments must be purchased with nonreflective surfaces to minimize unwanted reflections. The vet and the operating room staff must wear protective glasses. Laser scalpels also an explosive fire hazard when used with oxygen. A smoke evacuation system with expensive filters are needed to evacuate the laser plume. Typically, at least 1 extra person is needed in the operating room to monitor and run the extra equipment, and all personnel receive extra training in laser safety. Naturally, there is additional training and a learning curve for the surgeon. All these factors contribute to higher over head costs and higher prices for consumers. While there is little evidence of direct hazards of using lasers scalpels for pet surgery, significant documentation of the negative effects of laser smoke on the surgical team are well documented. During procedures that use a laser scalpel, the thermal destruction of tissue creates a smoke byproduct. Each year, an estimated 500,000 workers, including surgeons, nurses, anesthesiologists, and surgical technologists, are exposed to laser or electrosurgical smoke. The New SECOND HAND SMOKE! Surgical smoke plumes have contents similar to other smoke plumes, including carbon monoxide, polyaromatic hydrocarbons, and a variety of trace toxic gases. As such, they can produce upper respiratory irritation, and have in-vitro mutagenic potential. Think about that if you're in the veterinary field and applying for a job at a laser vet. Although there has been no documented transmission of infectious disease through surgical smoke, the potential for generating infectious viral fragments, particularly following treatment of skin growths, may exist. While the surgical team wear masks (which do not trap smoke particles) your pet undergoing laser surgery won't have a mask to stop the smoke plume of their own burning flesh from entering their lungs. This is why extensive smoke excavation systems must also be installed in the surgery room. A laser surgery device and the required fan and duct work to evacuate the smell of burning flesh are VERY Expensive. We know, we have sales people trying to sell us the set up all the time. Dr. Gerds estimates that the all up installed cost of a decent unit to be about $40,000 with exhaust ductwork, special clothing, tools and protective gear for staff. The business must pay for the added overhead expense. The way one pays for it is by either offering "Laser Upgrades" or spread out the cost other ways. We are pleased to notice more veterinary clinics dropping the usage of an "Upgrade" price option as a marketing tool. I have witnesses blood free declaws performed here by Dr. Gerds. She will leave a white towel on the table and you won't find a drop of blood on that towel. Regarding pain management, Advanced Care Pet Hospital's pain management protocols meet or exceed AVMA and AAHA guidelines. Think. If you slice yourself with a razor blade, or you burn yourself, most people agree that a razor cut will heal and hurt less than a burn. Laser scalpels burn skin tissue. Below are some findings regarding healing after thermal damage from Co2. Laser incisions had partial necrosis (dead flesh) of the wound edges and a more extensive inflammatory response; however, healing of the wound beds were similar regardless of technique. Conclusions: The CO2 laser provided better intraoperative hemostasis than CST. However, overall healing and increase in tensile strength of the skin-flap junction of the flaps created by the laser may be delayed during the first few weeks of wound healing. Clinical Relevance: Skin flaps used to repair large skin defects in dogs can be created and elevated with a CO2 laser. In areas of increased skin mobility or tension, skin flaps created with CO2 laser may be more susceptible to complications such as dehiscence, and care should be taken to minimize these complications. "The CO2 laser produces a zone of irreversible thermal injury (coagulative necrosis) along the wound edge, an observation that has been correlated with the well recognized delay in the rate of laser wound healing, postoperative wound dehiscence, and unacceptable scarring. As long as these tissue effects are recognized and understood, postoperative problems can be avoided." "For example, laser incisions should be made parallel to relaxed skin tension lines. This will allow wounds to be closed with the least amount of tension, thus reducing the risk of unacceptable scarring." "Similarly, cutaneous laser incisions should be placed in areas such as the head and neck that have a rich blood supply. When closing cutaneous laser wounds, I believe that absorbable suture materials should be avoided as the coagulative necrosis produced by the laser, in conjunction with the inflammationstimulated by the suture material can produce wounds with an unacceptable appearance. I prefer nylon or polypropylene suture, and leave the sutures in place approximately 7 days as opposed to the 3-4 days I leave sutures after cold steel blepharoplasty. "This gives the laser wounds an opportunity to heal more completely prior to suture removal."